Happy Monday! I hope you all had a fantastic weekend and are almost done with your Christmas shopping. I had a couple of restful days in Waterloo to recover from a hacking cough, and was able to squeeze in a short trip to HomeSense for some fabulous finds (sneak peek via Instagram). I still have more decorating to do around the house, but my Christmas cards are sent out and the gifts are all nicely wrapped. 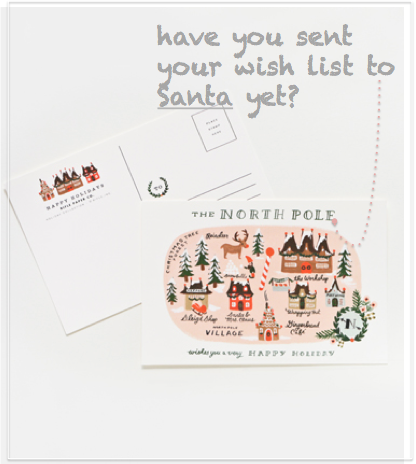 Where is your favourite place for stationery and holiday cards? 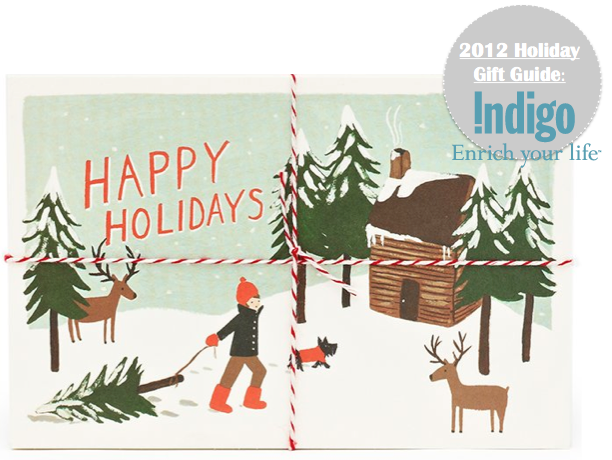 I love the assortments and varieties at Indigo, and especially the warmhearted collection from Rifle Paper Co. This stylish little man pulling a freshly cut Christmas tree back to his lodge (awaiting him a cup of hot chocolate I imagine) is the card I sent to my beloved friends this holiday season. image via Indigo courtesy of Rifle Paper Co.
As you all must know by now, Indigo is way more than just a book store with pretty stationery. Over the last few years, it has evolved into a mega one-stop-shop for home office essentials, decorating accessories, electronic gadgets, and trendy fashion statement for the ladies. Today, I will share with you my wish list and a wish list for HER with goodies from Indigo. Chris has been asking me for a few months now to turn the dining room into a multi-purpose dining/home office experience. I still need to figure out the furniture options (what to stay, what to go, better yet: what is new to buy), but I have nailed down a collection of sleek and worldly accessories for the future work station. First thing first, I know Chris wants to have music in the office, so a portable speaker that is energy efficient (so we can put it wherever we want) is high on the priority list. This ceramic phonofone from Science and Sons is stylish, sophisticated, no electricity is required. It is coming straight home with me. Chris is an outdoorsy guy and I know if I were to bring any accessories into his office, I will have to pick something that appeal to his love of nature. Lucky me, Indigo has these cast iron moose bookends and antler magnifying glass: perfect as desktop accessories. I also love this rich and soft nubuck leather journal made in Italy for a subtle hint of gentlemen club and luxury to the space. I always add a whimsical touch to spaces I design, and in this macho home office, I am throwing in this desk egg with golden nest made out of paper clips. Now for the girl friends in my life (or yours), I have selected a "Group of 7" they will surely love. This luxe faux-fur throw is a girl's best friend during those cold winter nights. For extra glamour and sparkle, this gorgeous pillow with a shimmery sequin band on pale lavender and pewter pear jar definitely deliver the elegant, feminine look I am after. Looking for ways to up the ambiance and coziness to your space, consider adding a grouping of these cable knit and yarn candles. Of course a girl has got to go out in style. These dramatic black & gold bracelets, super soft pull-through scarf with two faux-fur pom pom in mauve, and opulent ostrich leather tote in this delicious shade of deep raspberry pink are guaranteed to turn some heads on the street. Here you go ... my wish list and HER wish list from Indigo. Let's hope Santa can hear me all the way up north at the North Pole! 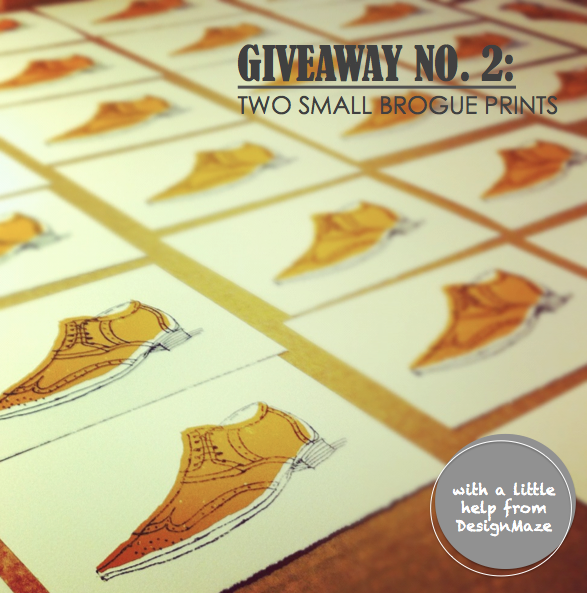 And Lisa and Chad for the brogue prints! Congrats to you all and please email me for your contact and shipping information. 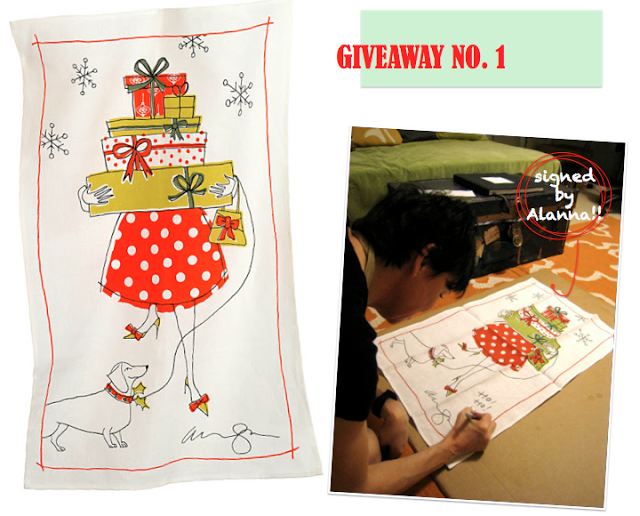 Hopefully I will be able to get your prizes to you before Christmas! 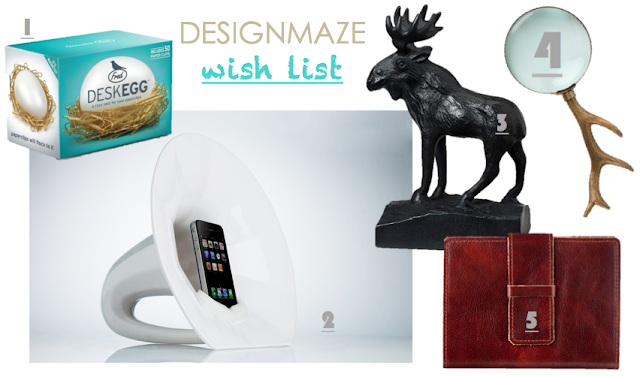 Love your wishlists Tim and I truly love Indigo especially for last minute gifts. I usually find something and the line ups generally aren't crazy. WAAAAAAAAAAHHH!!! 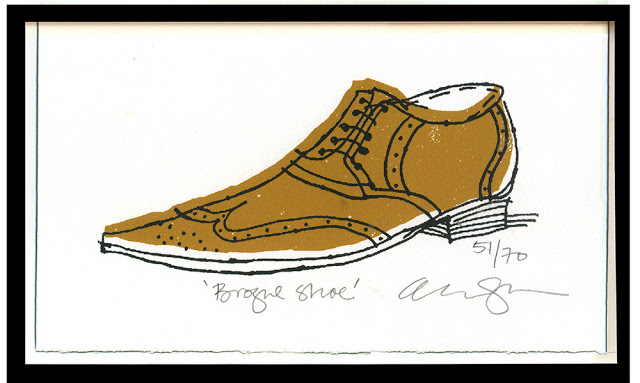 Tim, I believe you may have an inkling of how FREAKING EXCITED I am that I won this print!!! THank you thank you! Now please excuse me while I go run screaming circles around the house.... WAAAAAAAHHHH!!!!!!! Crazy girls! Like I said they won my giveaway last week too - but that art couldn't of gone to anyone better - YAY! These wishlists are fabulous! I've already stalked the links to compare prices and slip a few things onto a wishlist of my own! Loving the Phonofone III! I really like Indigo's holiday decor this year. I bought three stockings and tons of ornaments including tracking down the nostalgic glass pinecone oranments after a few stores. I always enjoy shopping in store for books and other things while sipping a cup of Starbucks. It's such a stylish bookstore.